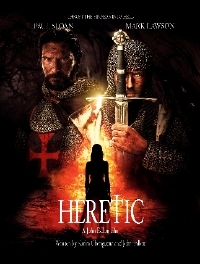 Director John Fallon (The Shelter) is teaming up with actors Paul Sloan (Vigilante Diaries, I am Wrath) and Mark Lawson (One Life to Live) on a Crusades era thriller called Heretic. Oscar Gold Productions’ Asko Akopyan has boarded the project as producer and the film is slated to shoot entirely in Armenia in 2019. When two Templars are sent home after losing the second Crusade, they are forced to battle a slew of varied enemies, the pity-less elements, and their own inner demons while trying to elude a mysterious assassin who is hunting them. Heretic was co-written by Fallon and Karim Cheriguene (Horsehead). Marc Natoli of Natoli Productions (The Proposal) is co-producing alongside Fallon’s Bruise Productions banner and JoBlo Movie Productions (Fallon is the co-founder of Arrow in the Head). Really excited about this one, folks. We'll bring you more as it comes. yea this is one I am looking forward to seeing.